Geometry encompasses more than the proofs you might remember from high school. It is used in essentially all professions. Some examples include architecture, landscaping, computer programming, fashion design, and packaging. Listed below are our favorite games and activities for geometry for elementary school. Narration helps students build their reasoning skills as they process what they heard or read and communicate that knowledge and the main ideas to another person. It is also an opportunity for students to justify their answers and begin to understand proofs informally. Nature study provides an opportunity to see patterns and shapes in nature. Five Triangles posts geometry problems approximately three times a week. They say the problems are geared for students in grades 6-8 although some problems are probably suitable for slightly younger and older students as well. 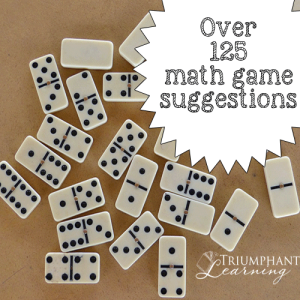 I would encourage you check these out to add to your math practice. I would encourage you to read their about page so you understand their philosophy before beginning the problems. I agree completely with their stated philosophy and am SO excited to have stumbled upon this website.